The event was held in Glasnevin Cemetery today. 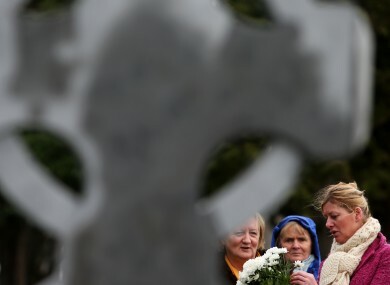 MEMBERS OF THE public gathered today in Glasnevin Cemetery in Dublin, to remember and honour all of the women who were incarcerated in the Magdalene laundries. The annual Flowers for Magdalene event was attended by many who came bearing flowers to place on the graves. Speaking at the remembrance event Sinn Féin Deputy Leader Mary LouMcDonald said that it was one year after Taoiseach Enda Kenny’s apology to the Magdalene survivors and still many surviving women have been excluded from the redress scheme and just a fifth of the eligible women have yet to receive their payments, she said. She called on the government to introduce the long awaited Restorative Justice Bill. “Pensions, medical care and the other provisions recommended by the Quirke report and signed off on by government have been delivered on. Confusion still remains for the small number of women living outside the state who wish to access medical services where they currently live,” she said. “These delays are of deep concern given the age of the women with many in declining health. Sadly, we know of at least three of the women have passed on in the year since the apology,” said McDonald. She said that it was the government’s “great shame” that it has failed to prioritise the Restorative Justice legislation and said that the the publishing of the bill should be a matter of urgency for the Justice Minister. “The nuns have still not apologised, nor will they contribute to the compensation fund,” added McDonald, stating the women should not have to suffer further due to additional delays in the restorative justice process. Email “Memorial event remembers women incarcerated in Magdalene laundries ”. Feedback on “Memorial event remembers women incarcerated in Magdalene laundries ”.